I have begun on my Bardathon Challenge! 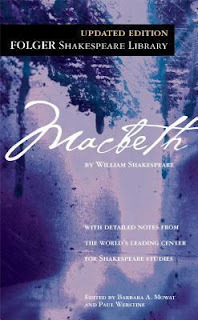 I haven't read any Shakespeare since high school but remember it being fairly arduous, so I was skeptical when, at dinner last weekend, two friends said I could probably read Macbeth in a couple of hours. In reality, it did take me longer, but only because of reading all the notes that accompanied the text. But I still read it all in one afternoon. So, this is the one about the guy named Macbeth, who meets up with some witches who make predictions that he'll become king so he then murders the king to make this happen. He had doubts, but his wife encouraged him, and they both end up feeling horribly guilty. But then he goes on to kill even more people until he ends up dead himself. It feels strange to write about something that is so incredibly influential and famous and has been written about to death by a million scholars. But I'm just going to do what I always do and tell you about my experience reading it because that's all I've got. I'm not a scholar of any sort. I wasn't even an English major. As I said, it was shorter and quicker to read than I expected. Even more surprising was that the language wasn't that difficult for me. I remember how impermeable it felt when I was in high school, but I know more words now, and honestly a few of them I just learned recently from reading Hild ("thane" and "wyrd" are two that come to mind.) I'm glad the language didn't bog me down like it did in high school, because that's the real strength of the play and I'm glad that now I can appreciate it. It's a pretty weak plot, to be honest. When it is discovered that Duncan, the king, has been killed, Macbeth feigns surprise. But then when they discover that the guards were also killed, Macbeth says he killed them because they killed the king. Nobody bothers to ask why he then pretended he didn't know the king was dead. I mean, seriously. Other parts of the plot I didn't completely understand because I don't really know how royal succession worked in this place and time, but I just rolled with it. Oh, Lady Macbeth, you were a greedy fool and your husband should never have listened to you. Go wash your hands some more. Although I didn't totally love it, I liked it more than I expected. Honestly, I thought it was going to be a really tough slog and would involve lots of deciphering passages and puzzling over meanings and having to read a ton about it to get anything out of it. Truthfully, I have read a bit about it since finishing, but not because I was so desperate for help. I read the essays included in the book (this is the Folger edition), and even watched some lessons from the Great Courses production How To Read and Understand Shakespeare, which is available through my library on hoopla. Most interesting in this extra reading/watching were the discussions about how this play would have been staged in Shakespeare's day, without scenery and with few props, but elaborate costumes. There's a theater company in Virginia that performs Shakespeare this way now so that people can get a sense of how it was originally. Another point of interest is that one of the notes in the book mentions that many scholars and editors believe that some of the scenes with the witches were written by someone other than Shakespeare. Which led me to read a bit more about that, and about the different editions of the work that have existed. I mean, this is really really old so many of the earliest editions were altered a lot and it can be difficult to know a lot about the original version and its context. Reading about Shakespeare is, of course, a rabbit hole and I could spend a whole lot of time reading more about this one play. But I have three more to read this year, which honestly now sounds like a pretty low bar. So it's possible that my year of Shakespeare may turn into more than I intended. Only time will tell!